Political parties like AAP and BSP should learn to stomach the election results. The elections are over, but the buzz around electronic voting machines (EVMs) refuses to cease. Following the BJP's landslide performance in the Uttar Pradesh and Uttarakhand elections, a lot of people have raised doubts over the reliability of the EVMs. While BSP supremo Mayawati and AAP’s Arvind Kejriwal have alleged that the EVMs were tampered with in Uttar Pradesh and Punjab elections, Congress’s Harish Rawat too joined the chorus after a disastrous performance in the Uttarakhand Assembly elections. Reacting to the allegations, the Election Commission of India on Thursday (March 16) stated that "EVMs are not tamperable". It has also asserted that the integrity of the electoral process is preserved. 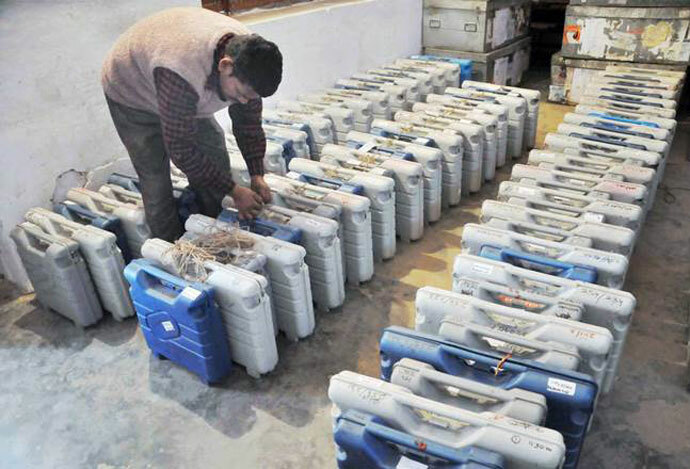 But are the EVMs really tamper-proof? 1) An EVM is an electronic devices used to record votes. They are made up of two machines — one is the control unit and the other balloting — and joined by a five-meter cable. While a presiding/poll officer is in charge of the control unit, the balloting unit is placed inside the voting compartment. 2) Every EVM has an identity number, which is recorded in the Election Commission’s database. Before the counting of votes begin, the ID is cross-checked against the database to ensure there's no foul play when it is being transported to and from polling booths. Also, the machines are guarded by central forces between the period of voting and counting. 3) As far as the counting of votes are concerned, the presiding officer hands over an "account of votes recorded" to each polling agent once the polls draw to an end. During counting, the agents tally the total with these accounts to check any discrepancy. Also, results are displayed by pressing the "results" button. This button is usually sealed and cannot be pressed unless the presiding officer presses the "close button" at his end. 4) Many reports have surfaced in the past as well that a small chip with a bluetooth connection can be inserted into the machine and it's possible to control that chip from a mobile phone to manipulate results when a vote is being cast. However, it seems impossible that such chips can be inserted in so many voting machines. 5) Also, when the machines are ready to be sent to polling booths, it's not EC officials (or any other human beings) who decide which machines will be sent to a particular constituency. It's done through computerised random selection. 6) To ensure further safety, mock polling is done before elections to test the EVMs. 7) Moreover, representatives of all political parties are invited a few months before an election. Then after the final candidate selection is done — 13 days before the polling date — the machine is again tested in the presence of the candidate or party agent. All those present have to sign a certificate that the EVMs are in order. 8) Once the machines are in the field, elaborate checks are put in place to ensure there is no malpractice. On the day of polling, a mock polling is done for an hour in every polling station where 60-100 votes are polled to check if the buttons are working right and not rigged in favour of any political party. 9) Yes, all electronic machines have a potential to be manipulated or to go wrong. However, the chances of manipulating thousands of EVMs to influence elections results in one particular way seems quite difficult. 10) But then if everything is okay with the EVMs, why did the voter-verified paper audit trail (VVPAT) come into the picture? Well, it was in response to a petition by BJP leader Subramanian Swamy that the Supreme Court had asked the EC to introduce the VV path or voter verifiable paper audit trail, where a printer is attached to the EVM. When voters press the button of their choice, the name comes up on the screen for six seconds for them to see it. Then the paper slip goes automatically into a sealed box. Any accusation of rigging can be proved if the result of the machine and slip is not the same. The VVPAT system is being introduced in a phased manner and is likely to be achieved by 2019. besides ensuring free and fair polls, this was done to resolve disputes over the reliability of EVMs, if any. 11) According to chief election commissioner Sanjay Srivastava, it is not possible to tamper with EVMs. Moreover, there's no proof of EVM tampering till date. Although some cases of EVM tampering have been presented before the Supreme Court, nothing has been proved so far.